Abstract: A 12-year-old French Bulldog was treated with weekly acupuncture sessions for a chronic progressive spinal cord injury which had caused both upper and lower motor neuron signs to both his left and right hind legs (paresis, ataxia); improvement of neurologic function and quality of life were appreciated by the owner after five sessions. History and Presentation: Sully, a 12-year-old neutered male French Bulldog presented in December 2016 for weakness and trouble with mobility in his hind end. Owners could not pinpoint an exact acute onset as there was no known trauma or incident which preceded these symptoms. Sully could no longer jump up onto furniture or climb long staircases. Owners also noted that during longer walks, he would sink in his hind end, drag his toes and more easily lose balance in his hind legs. Physical Examination and Clinical Assessments: Sully’s baseline physical exam as well as orthopedic exam were unremarkable. He had normal range of motion and no sign of discomfort in either of his hip or knee joints. Sully displayed tenderness and subtle reactions (flinched, looked back, sank in hind end) when palpating along his caudal thoracic and his entire lumber spinal cord region. He had normal conscious proprioceptive reflexes (CPs) in both thoracic limbs but slightly delayed CPs in both his hind limbs. His left hind leg had a decreased patella reflex and a positive crossed extensor reflex while his right hind leg had a normal patella reflex and did not have a positive crossed extensor reflex. When watching Sully walk, he displayed mild to moderate ataxia in the hind legs, would intermittently scuff his hind toes, and would occasionally lose balance and fall over on his rear end. Mild left hind leg abduction was noted during his walks. Myofascial exam revealed tightness and taut bands in dorsolateral neck muscles, bilateral triceps, and bilateral quadriceps. A complete blood count, chemistry panel and 4DX tick test were all normal. Sedated radiographs of his hips, knees, spine and abdomen were taken; the only abnormalities included ventral spondylosis which was present at the junctions between several caudal thoracic and cranial lumbar vertebrae. Medical Decision Making: Sully tried Dasuquin, omega 3 fish oils as well as a trial of Rimadyl; his owners did not appreciate any improvement after two months. Since studies have shown that acupuncture in addition to the traditional conservative management of spinal cord injury has been superior to just rest and pain medications alone, we decided to try acupuncture (1). Definitive (or Putative) Diagnosis: Based on the radiographs, the chronic progressive nature of signs, and the combination of both upper motor neuron and lower motor neuron deficits to his hind legs, the most likely diagnosis is a caudal thoracic and entire lumbar spinal cord injury which is most likely a result from the ventral spondylosis of his vertebra as well as multifocal chronic type two degenerative intervertebral disc disease. Acupuncture Treatments: BL18, BL19, BL20, BL21, BL22, BL23, BL25, BL27, BL28 and Bai Hui were chosen to target the thoracic and lumbar spinal cord neuropathy. BL 54, GB 29 and GB 30 were occasionally used when tolerated to stimulate his sciatic nerve and help neuromodulate via peripheral nerve stimulation. During some treatments, dry needling was used in taut bands and trigger points in the dorsolateral neck, triceps and quadriceps muscles which were likely caused by overcompensating weight due to weakness in the hind end. GV 14, GV 20 and ST 36 were used to decrease stress and inflammation by upregulating the parasympathetic system and downregulating sympathetic tone. Treatments were initiated at once a week for five weeks with 0.16mm needles; he reacted to larger needles so electroacupuncture could not be used. 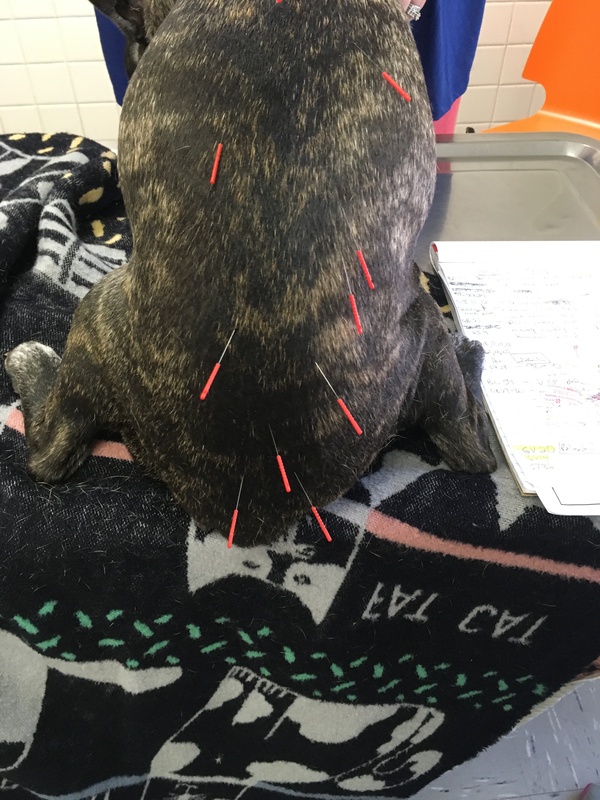 Outcomes, Discussions, and References: Improvement in mobility, comfort and strength were noted by his owner and is likely attributed to the various cellular and physiologic benefits of acupuncture on spinal cord injury. We know that acupuncture has been shown to reduce the size of a spinal cord lesion by downregulating apoptosis of neurons and oligodendrocytes (2). Electroacupuncture also reduces inflammation and glial scarring within the spinal cord via inhibiting astrogliosis and reducing platelet derived growth factor expression; both mechanisms have likely contributed to improving neurologic deficits after spinal cord injury (3). Electroacupuncture can also promote recovery after spinal cord lesions through a mechanism of upregulating the expression of various endogenous neurotrophins which are known to promote nerve cell growth and repair (4). Hayashi et al. Evaluation of EAP treatment for T-L IVDD in dogs. JAVMA Sep 2007. Choi DC, Lee JY, Moon YJ. Acupuncture-mediated Inhibition of Inflammation Facilitates Significant Functional Recovery after Spinal Cord Injury. Neurobiol Dis. 2010 Sep;39(3):272-282. Epub 2010 Apr 9. Liu F et al. Electro-acupuncture treatment improves neurological function associated with downregulation of PDGF and inhibition of astrogliosis in rats with spinal cord transection. J Mol Neurosci. 2013;51:629-635. Wang TH, Wang XY, Li XL, Chen HM, Wu LF. Effect of Electroacupuncture on Neurotrophin Expression in Cat Spinal Cord after Partial Dorsal Rhizotomy. Neurochem Res. 2007 Aug;32(8):1415-1422.